Dr. Hubert van Tuyll's family experience in World War II can be summarized in one of his favorite paintings, which shows three Lancaster bombers flying over the Netherlands on their way to Nazi Germany. Photos by Arthur Takahashi. 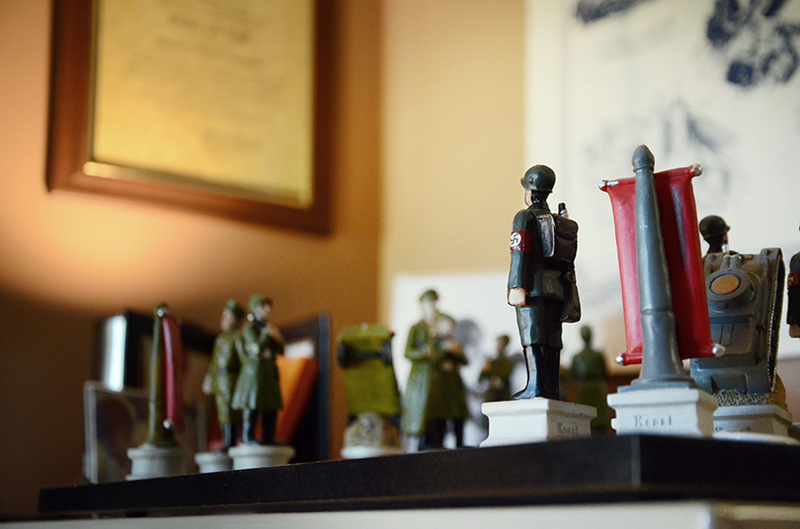 From a Nazis-versus-Soviets chess set given to him as a gift to portraits of military figures to hundreds of war books displayed in his office, it is clear Dr. Hubert van Tuyll cares about the past. But of all the decorations and books, the memory the history professor cherishes the most hangs on his door for all to see. A graduation gift from a friend, this Nazis-versus-Soviets chess set represents Dr. Hubert van Tuyll’s research project about the Eastern Front in World War II. Two copies of the same high-contrast bluish painting — a reminder of what van Tuyll’s family endured in World War II and the reason he became a military historian. 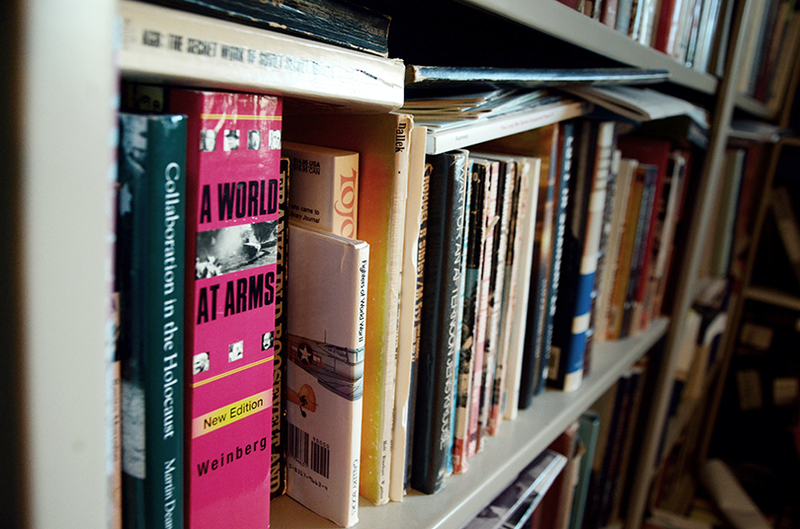 That family memory would eventually lead him to a prestigious book award, previously won by heavyweights like President Jimmy Carter, Pulitzer-Prize recipient Rick Bragg and award-winning novelist Pat Conroy. The image shows three British Lancaster Bombers flying low at night over a river and windmills in the Netherlands. The aircraft, which played a major role in defeating the Nazis, were on their way to bomb Germany. His father also recounted waking up to the sound of airplanes cutting through the sky over the city of Utrecht in the central Netherlands. 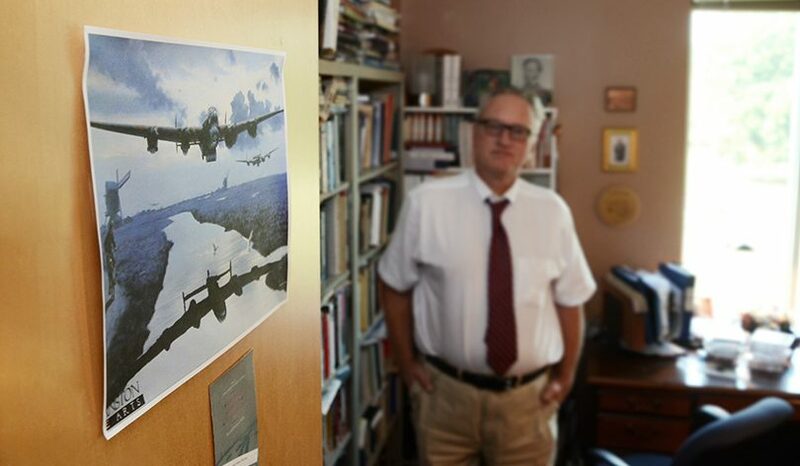 Hundreds of war books color an entire wall in Dr. Hubert van Tuyll’s office. It was May 10, 1940 — the day the Nazis invaded the Netherlands and ended Dutch neutrality. 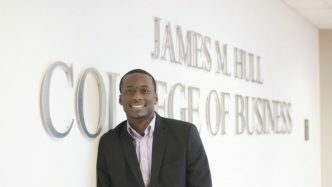 “I grew up hearing a great deal about it,” van Tuyll said. His parents, for example, said they drove by the port city of Rotterdam a few days after the Germans had bombed it and saw it still burning. They also told him about the failed Allied attack on German troops in the city of Arnhem in 1944, one of the major battles of World War II. Looking at the two copies of the painting hanging on his office door, van Tuyll also remembers his late Canadian brother-in-law, who was a Lancaster pilot for the Royal Canadian Air Force. Dennis Trudeau was in the first flight of his parachute battalion to leave for the invasion. His mission should have started the day before but a furious storm had delayed it. Scared, he said a prayer and asked God to let him see another sunrise. It was June 6, 1944. D-Day. When Trudeau jumped from his plane, he saw all the flares and explosions from above. As he fell to a landing spot just off the Normandy coast, reality sank in. He was in the middle of an all-out war. He lost most of his gear during the jump, landed eight miles from the target and was attacked by friendly fire. Hiding behind a tree stump saved his life, but some of his fellow soldiers were not so lucky. In the next few months, Trudeau would be captured and held as a prisoner of war at a German camp. But he survived the war and has lived to see many sunrises. 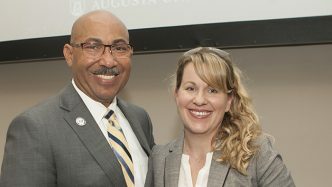 He eventually returned to the United States, served as mayor of Grovetown, Georgia, from 1988 to 2007 and became a city council member in 2011. 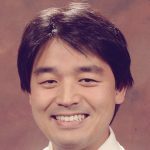 He left the position on Nov. 1. “In their own words: Augusta and Aiken area veterans remember World War II” shows how 147 local people experienced major events during World War II and how their stories fit into a broader historical context. Trudeau is one of 147 World War II veterans from the greater Augusta area whose memories are told in van Tuyll’s In their own words: Augusta and Aiken area veterans remember World War II. Co-authored by James Garvey, professor emeritus of English and retired chair of the Department of Communication at Augusta University, and Douglas Higbee, associate professor of English at USC Aiken, the book is more than just a collection of individual war stories. The result is a unique book that shows how different people experienced major events during World War II and how their stories fit into a broader historical context. 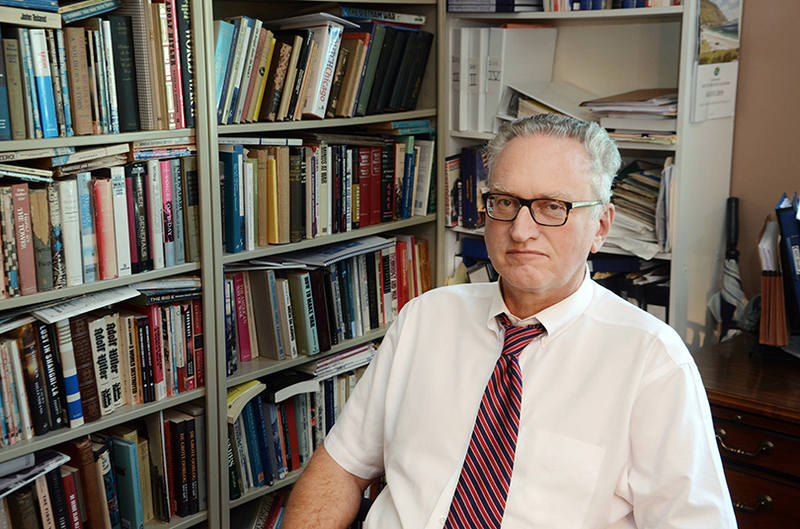 Dr. Hubert van Tuyll began studying military history at a young age. He was influenced by all the World War II stories he heard from his parents, who survived the Nazi occupation of the Netherlands. 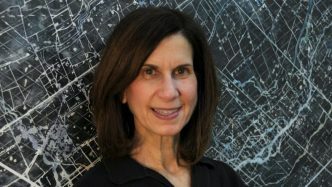 In part due to their storytelling approach, the authors were recently awarded the prestigious Southeastern Library Association’s Outstanding Authors Award for non-fiction. The interviews for the book came from the local Veterans History Project created by Fred Gehle, an Augusta resident. The project, done in conjunction with the National Archives, has compiled almost 1,000 video interviews with area veterans over the course of a decade. 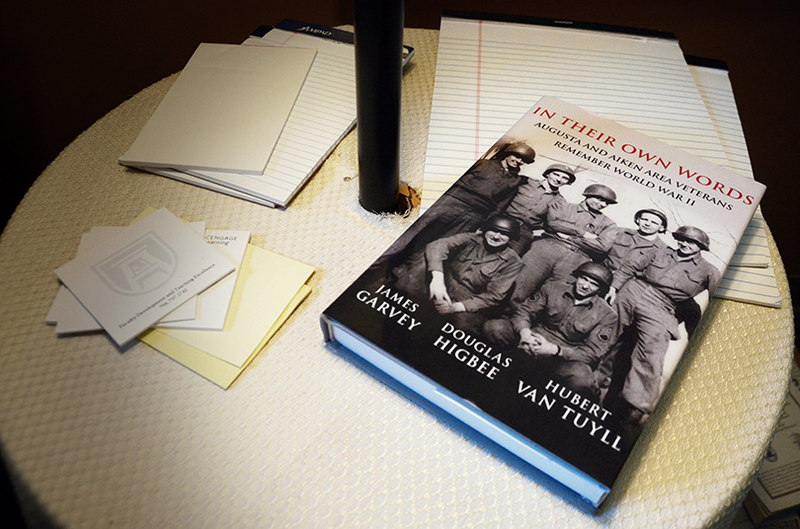 For their book, van Tuyll, Garvey and Higbee selected only the veterans who had unique experiences during the war or who had a significant impact in the greater Augusta area. Besides Trudeau, the authors also included Carl Sanders, governor of Georgia from 1963 to 1967, in their book. “In the long run, it was a difficult project, but it was a worthwhile one,” he said. 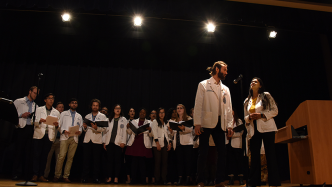 The five-year book project would not have happened without the support from Augusta University, van Tuyll said.